I remember waking from surgery two years ago. The pain was searing. I knew, profoundly, that things had gone very, very wrong…there was this space of time before the recovery nurse realized that I was awake and administered the next dose of pain killers and when I awoke, and all I could process was how much pain I was in. The ceiling tiles above me- plain popcorn cracker jack tiles that usually lined up in nice little rows like soldiers- jumped and tilted like a crazed wheel-go-round. When the nurse crossed my line of sight, she had this wavy look to her. 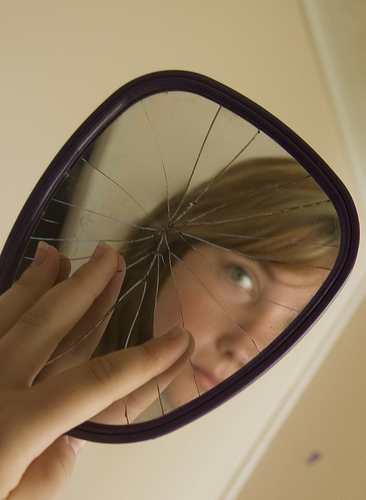 “Like a cracked mirror, ” I remember thinking, hazily. When the pain killers entered via my IV, it was like someone slowly lined everything back up again- the ceiling tiles fell into orderly rows- and the nurse’s face resembled a human one and not a Picasso impression. Not much later, my ob walked in to check on me, and another mirror shattered. I don’t remember so much the grief at that time- I just remember how the whole world seemed to have this weird hue, technicolor, almost garish, and yet, frighteningly beautiful. Sunrises and sunsets out the back door, setting over the hills- they would make this profound ache in my chest that I never knew had existed. And ever so slowly, things lined up again- reasonable rows and sensible ways returned, and although I knew I would never be the same, life took on a new normal. As I’ve traced out the moments of the last few months for you here, I see fractured reflections that are not what they seem. I don’t think I realized at the time of the surgery that a part of me had spun off and broken. I don’t think we ever realize it at the time until we have the luxury of hindsight to see where things careened off the tracks- perhaps if we could see we’d never end up in the millions of goofy, dumb, oh-so-very-human jams we find ourselves in. I look back now and I see all the fractionated pieces for what they are, and it just seems strange. How could I have gotten so far off track? As I was walking into April, I didn’t have the twenty twenty reverse vision I have now, here in August. (And I question that I even have 20/20 now.) I just had this prayer. Lord have mercy. In it’s own way, April was another awakening from anesthesia. Whether I had realized it or not, my soul-life had passed into unconsciousness and ignorance over a year and a half or two; the searing pain of April was reminding me that blood still flowed in the veins. Looking into the mirror of myself (boy, the metaphors are getting complicated here, but I think you understand what it is I am trying to say), it was as if I just first realized that something was not right- that the reflection did not look like it was supposed to. I am such a self-assured dork. I find it an appalling part of myself, and when I have the chance to glance back at where my pride has gotten ahead of my cognizance, it brings me such sorrow. The time for reading the Word and prayer seemed to be magically happening. (HA. As if that is ever true. The Lord ordained and so it occurred. Magic had nothing to do with it.) I had this smug little feeling going on- “hey, look, I’m doing it! the good Christian thing!” That feeling lasted for maybe a day or two; then I started looking for excuses to get away, because what was meeting me in those times was not sunshine and roses. If I could give a word picture, I’d refer one to Revelation 10:10, where St. John eats the scroll- it tastes sweet as honey but turns bitter on his stomach. Not that I’ve ever faced the realities that the beloved disciple did, or that I could even compare in sufferings; I can’t even imagine what it must have been like to experience the prophesy there on the island of Patmos. But I’ve never had Scripture do what it did (does even today) before that time…it was odd. Like slaps in the face, a good and thorough shaking…the “nice” “good” veneer was off and there the terrifying Truth staring right back at me. The Word like honey turned bitter on my stomach. This very heavy hand came to rest upon my soul as I realized just how many times I was for evil instead of good. What was most appalling to me was that it was often out of ignorance and omission- because I was not actively for good I was passively for evil. Because I lacked spiritual discipline, because my life had become rank and stagnant, I was for evil. Oh what confessions needed to be made! It is a strange place to be in, as a child and now adult who had been raised in the church, to come face to face yet again with one’s sin. Each time it has occurred there has been a level of understanding- but I don’t think it has struck me so very hard or as profoundly as April did. It was like the veil was torn for my eyes for a bit- so that I could see that the reflection I thought I had- that of Christ- was awfully dim and faded- and the mirror I was looking at and holding so tightly to was a fractured piece-meal of my own making- very much not of the Lord’s intent for me. By the time I left April’s blustery winds and rainy days, I had come to understand that the Lord was calling me higher up and further in; it was time to grow up in some profound ways. It was time to let go of all that I was and thought, of what I wanted to be- because what I wanted wasn’t good for me. Or anyone else for that matter. (I find this whole process so difficult to explain. I can only hope that you, dear hearts, have experienced this at some point and can understand what I am trying to say.) It is hard to peel off skin and peer inward and then spill it here. I can see you. Thank you for writing. I need this story; I cannot say why.